Last night, the special event held for Final Fantasy XV revealed a multitude of announcements and information, most of it throwing fans into a wild excitement. One of those announcements was to officially unveil the Deluxe and Collector’s Editions of the upcoming Final Fantasy game. 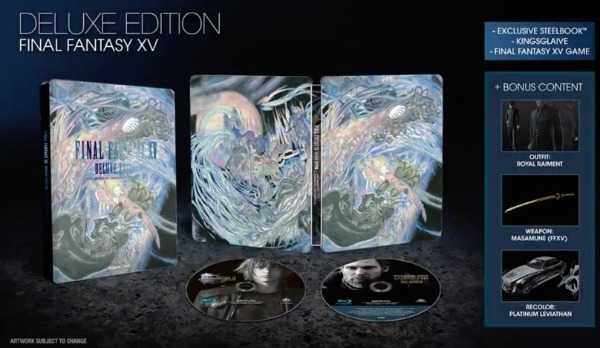 The Deluxe Edition of Final Fantasy XV will include the game, a steel case with Yoshitaka Amano art, the Final Fantasy: Kingslaive feature film, Royal Raiment outfit, Masamune weapon and of course platinum leviathan recolor for the in-game car. If you decide to take the route of the deluxe edition, it will put you back $89.99. Not bad for all that stuff, right? But wait until you see what’s in the Ultimate Collector’s Edition. 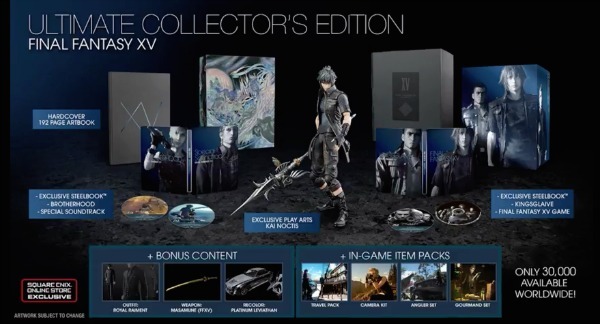 The Ultimate Collector’s Edition for Final Fantasy XV will include everything from the Deluxe Edition, plus a hardcover art book, a separate set of steelbook cases all depicting the game’s cast, the upcoming Final Fantasy XV anime series on DVD, in-game gourmand set, in-game travel pack, an in-game camera kit and angler kit and an exclusive Noctis figurine. If you’re a serious Final Fantasy fan and really need the Ultimate Collector’s Edition, it’ll cost you $269.99. But you need to decide fast, because only 30,000 of the Ultimate Collector’s Editions will be made available, and if Final Fantasy is as popular as it seems, that number will dwindle in an instant. Both the Deluxe and the Ultimate Collector’s Editions were made available to pre-order last night, so you’ll want to make sure you put your name in before it’s too late. For more information, you can visit the Final Fantasy XV official website.